We have an exemplary service that delivers direct to the work area of the designated user, at an arranged time, unpacks the items, sets them up, and shows the member of staff how to use them; this frees the member of staff from having to go through the sometimes stressful process of unpacking the products themselves and familiarising themselves with their operation. 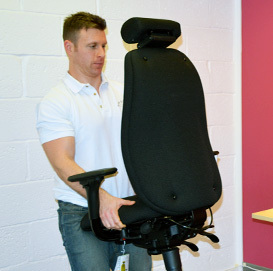 All products, unless otherwise specified by our clients, are set up at the time of delivery; in particular our chairs are set up for the user on the actual day of delivery which helps them get up and running sooner. 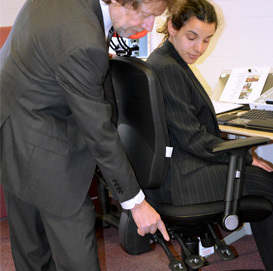 Our chairs are set up for the user and they are shown how to operate them on the actual day of delivery which helps them become more productive and comfortable sooner, and this service also helps them understand how to adjust their chair for maximum benefit on an ongoing basis. Our team of fully trained furniture installers are there to provide a careful, efficient and detail conscious service; and our account managers liaise with our customers to help finesse the service to their satisfaction.